Includes the Muller Peninsula in Alaska, an enlarged Australia, and the Sea of the West in North America. A beautiful and impressive map of the world drawn by Jean Janvier in 1762. Depicts the entire world on a double hemisphere projection framed by elaborate baroque cartouchework. North America, particularly the Northwestern quadrants, are exceptionally interesting and speculative. A magnificent inland sea, called the Sea of the West or in this case the Mer de L'Ouest, is presented in the northwestern part of the America. This body of water, alternatively called the Sea of the West or Baye de l'Ouest, was speculated by Philippe Buache and De l'Isle in the early 18th century based upon wishful thinking, American Indian stories, and the somewhat questionable 16th century explorations of Juan de Fuca. Here Buache gives the Mer de l'Ouest its fullest expression, though he specifically does not connect it to either the factual network of lakes and rivers extending westward from the Hudson Bay or to the speculative De Fonte network just to the north. This is also one of the few maps to include the speculative 'Muller Peninsula.' Postulated by the German geographer Gerhard Friedrich Muller, the Muller Peninsula follows the Aleutian Islands roughly in the form of modern day Alaska. Subsequent Navigations by Cook and others would soon disprove the peninsula theory. By contrast the northeast parts of Asia, which had recently been explored by Vitus Bering and Tschirikow, are depicted with a fair approximation of accuracy. Terre de Gama and Terre de la Company, speculative mis-mappings of the Japanese Kuril Islands by the 17th century Dutch explorers Maerten de Vries and Cornelis Jansz Coen , appear just northeast of Yedso (Hokkaido). Gama or Compagnie remained on maps for about 50 years following Bering's voyages until the explorations of Cook confirmed the Bering findings. South of the equator the shores of Australia or New Holland are speculatively mapped with a dotted line defining the southern and eastern portions continent. Van Diemen's Land or Tasmania is attached to the mainland, which itself includes New Guinea and parts of the New Hebrides, identified here as Terre de S. Espirit. Terre du St. Espirit, in fact the New Hebrides was mis-mapped by the near insane 17th century Portuguese navigator Pedro Fernandes de Queiros who proclaimed that he had discovered the Great Southern Continent, or Terre Australis. Not to be confused with modern day Australia, Terre Australis was a vast speculative continent that supposedly covered much of the southern hemisphere in Aristotelian symmetry with the bulk of Asia in the Northern Hemisphere. Although by this time most cartographers had stopped mapping Terre Australis, some, like Janvier, perhaps with the great myth in mind, wishfully increased Australia's dimensions. Both hemispheres are crowned with an elaborate decorative cartouche in the late baroque style. Drawn by Janvier as plate no. 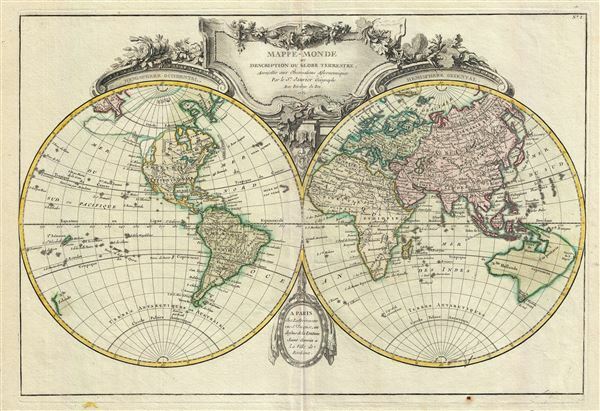 1 in Jean Lattre's 1762 Atlas Moderne. Lattre, Jean, Atlas Moderne ou Collection de Cartes sur Toutes les Parties du Globe Terrestre, c. 1762.